When my husband and I got married a few months ago we wanted to celebrate with all of the people that we love and some things we love as well. Since I’m that girl, you know, the girl who’s been planning her wedding since she was ten. I have always known that I wanted to include something nautical. Flash forward to 2015. The surprise proposal came at the beginning of August and my dream of having a summer wedding would be over if we didn’t act fast. The question came, how can we hold an outdoor reception and include our favorite elements of sailing when the lakes in Utah were in a drought and our sailing season was cut early this year due to low water levels in our lakes. September gave Utah fantastic weather without the water we needed. That’s when we put on our creative captain hats and came up with a Hobie Holder at a Garden Wedding Reception. Any designer will tell you that a theme is crucial when planning a wedding. Or at least tying in an overarching idea. We headed down to the dock for our background landscape to announce our upcoming nuptials. We considered taking pictures on the boat while on the water, but our Catalina 22′ is a bit too small for a captain, crew, photographer and an engaged couple clearly on cloud nine. So we grabbed our photographer and ended up with snapping a few shots on the dock. The engagements set the tone for the wedding. I believe we got to show off our (my) sailing side. Some fellow Sunfish sailors even got a cameo while out for an evening cruise. With pictures checked off our list our good family friend (and part wedding planner) had the novel idea to pull together some sailing and nautical elements at an outdoor garden reception. 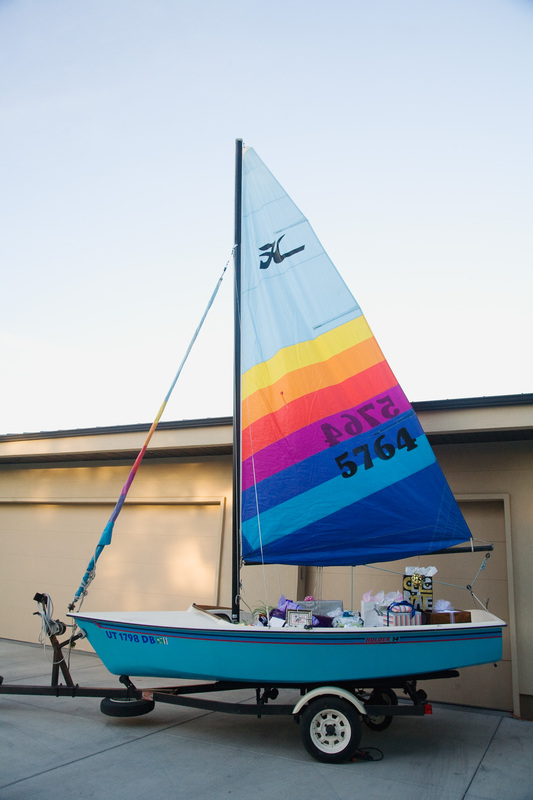 Why not set up our Hobie Holder to display the presents? It was brilliant. I think my favorite part was the splash of color it added to the entrance of the garden. No, our reception wasn’t dowsed with lots of little nautical elements. But it was bright. It was simple. It was us. Sometimes when you want a wedding that includes sailing and it’s not sailing season, you have to get creative. Leave a comment below and send us your ideas for including sailing at your wedding.